That’s right Appalachia, your cult leader Trump’s attempt to turn back time to the 19th Century to save your dying coal industry is not going to happen. He played you for fools. 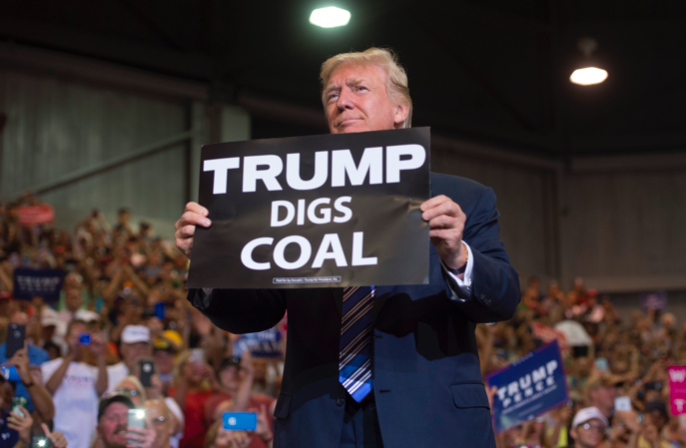 Donald Trump has done everything he can think of to try and make it appear as if he’s “saving coal.” He’s signed a bill to allow more coal waste to be dumped into streams and rivers without remediation. 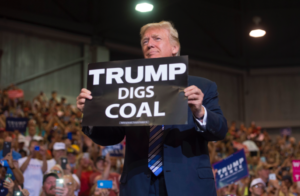 He’s halted a study on the health issues of coal miners and another on the health effects of surface mining on nearby residents. He’s relaxed regulations on emissions from coal power plants, killed the entire Clean Power Plan, opened up new areas of federal land for mining, relaxed emissions standards, and put forward a plan that would simply nullify most federal regulations over coal power plants. He’s disbanded the EPA’s air pollution panel and proposed allowing power plants to send more mercury and heavy metals into the atmosphere. Along with can-you-believe-he’s-still-Secretary of Energy Rick Perry, Trump even tried to use emergency powers not touched since the 1950s to force utility companies to use more coal. That last attempt was stopped at the last minute, because Trump’s own advisers finally convinced him—for the moment at least—that it was both idiotic and illegal. But in spite of all Trump’s promotion, coal plants closed at a record pace in both 2017 and 2018. And on Wednesday, the Energy Information Administration reports that coal consumption has plunged to levels not seen since 1979. The idea that the downturn of coal is related to regulations put in place by Obama is wrong on every front. Not only was peak employment in coal so far back that it doesn’t even make the chart above, but construction of new coal plants has dropped steeply from the 1970s on. The reason is simply that as other energy sources became more reasonable, the high up-front cost of a coal plant has become less and less attractive to utility companies. 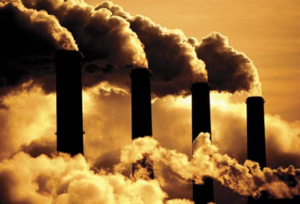 Unlike gas, wind, or solar, coal plants are very difficult to scale. To obtain reasonable cost-per-megawatt requires an enormous up-front investment. The Kemper County, Mississippi, plant that recently went into operation after more than a decade in development topped $7.5 billion in a futile effort to build a “clean” coal plant before giving up and switching to natural gas. That’s an extreme example, but even a more traditional plant built today would top $1 billion. If anyone was building one. Which they are not. There is one single unit slated to finally reach production in 2019—not a new plant, but just one new generator—and that’s the last thing in the pipeline. Even in the best of business environments for coal—in the 1960s and 1970s, decades before most of the regulations that Trump is rolling back—the payback period on a coal power plant approached 40 years. A plant built under Dwight Eisenhower could literally still be in the red when Bill Clinton was in office. Most of that coal being burned in 2008 was going into plants that were built decades earlier. Over their lives, those plants had earned out and achieved a marginal profit, but they were also facing rising maintenance costs and approaching end of life for major components. Just in the last five years, the price of coal has fallen, but the cost of coal-based power is up more than 15 percent, mostly because of high maintenance costs on plants that were slated to close long ago. The number of coal plants on the drawing board fell into single digits by 2007, as the combination of more readily available natural gas and the plunging price of wind made it clear that coal plants were unlikely to be around long enough to ever reach a payback point. That’s why 2007 saw plants canceled from Kansas to Kentucky to Florida to Texas. After that date, the idea that coal was going to fade from the national energy picture was never in doubt. Barack Obama’s time in office didn’t bring a slaughter of proposed coal plants, because by the time he walked through the door, there were no planned coal power plants. There was, and is, absolutely nowhere for the industry to go but down. At this point, Trump could roll back every requirement for building a coal power plant — not just Obama-era regulations, all regulations. It wouldn’t result in a single new plant. Because not only is no one convinced that coal plants will be around to collect their first check in 2058, even right now it is cheaper to build new solar or wind power, from scratch, than it is to simply operate an already existing plant. Forget rolling back regulations. Trump could be handing out ready-made plants. For free. And no one would sign up to operate them. However, if Trump starts handing off money to plan for new coal plants, there are plenty of operators who will be happy to take the cash and pretend, until he is gone. Coal is going to finish out 2018 at a level 44 percent below where it was in 2007. 529 coal generation units have been retired since then. The one new unit coming on line next year represents 17 megawatts of power. However, there are already 11 gigawattsof coal-based generation slated to end next year, and that number is steadily increasing. Still, those planned retirements for 2019 and 2020 are much smaller than the numbers that closed in 2017 and 2018. That’s not because Trump is “saving coal.” It’s because, now that it’s less than 30 percent of electrical generation, there’s not that much coal left to save. The biggest issue utilities face now is simply building out new wind and solar quickly enough to replace coal, and doing it before the falling demand brings on an ultimate crisis that makes it impossible to supply remaining plants.